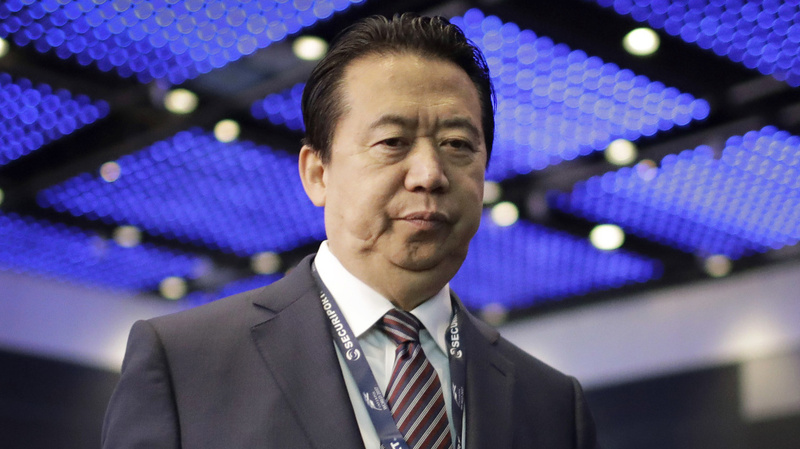 Meng Hongwei was the president of Interpol when he went missing in China last fall. He's now facing prosecution on bribery charges, China's Communist Party says. Meng Hongwei — who was the president of Interpol when he was reported missing in China last fall — has been expelled from the Communist Party of China and will be prosecuted on bribery charges. Meng's case drew international headlines last fall, after one of the world's top law enforcement officials suddenly lost contact with his family during a trip to China from Lyon, France, where he had been living with his family near Interpol's headquarters. Meng's wife reported him missing; she later received an alarming text on her phone, showing a knife emoji. Interpol also sought answers — and eventually received notice that Meng had resigned midway through his four-year term. Soon afterwards, Chinese officials said they had detained Meng on suspicions of bribery. "According to Chinese authorities, Meng used his position to seek employment for his wife and connived to use his authority for personal gain," NPR's Rob Schmitz reports from Shanghai for our Newscast unit. "Meng's wife, Grace Meng, says she asked French President Emmanuel Macron to discuss her husband's case ahead of Chinese leader Xi Jinping's visit to Paris this week. She's currently in France and has applied for asylum there, because she fears for her life." In addition to his prominent and groundbreaking Interpol post — he was the first Chinese official to hold the position — Meng also served as China's vice minister of public security. He's now stripped of that role, which he had gained under Zhou Yongkang, the former security czar who is now serving life in prison on bribery charges, snared in President Xi's anti-corruption campaign. As it announced the charges against Meng Wednesday, the Central Commission for Discipline Inspection of China's Communist Party accused him of lacking principles and leading an extravagant lifestyle. As NPR reported in October, Meng's biography page, which had previously listed his experience leading China's counterterrorism office, has been scrubbed from the security agency's website.